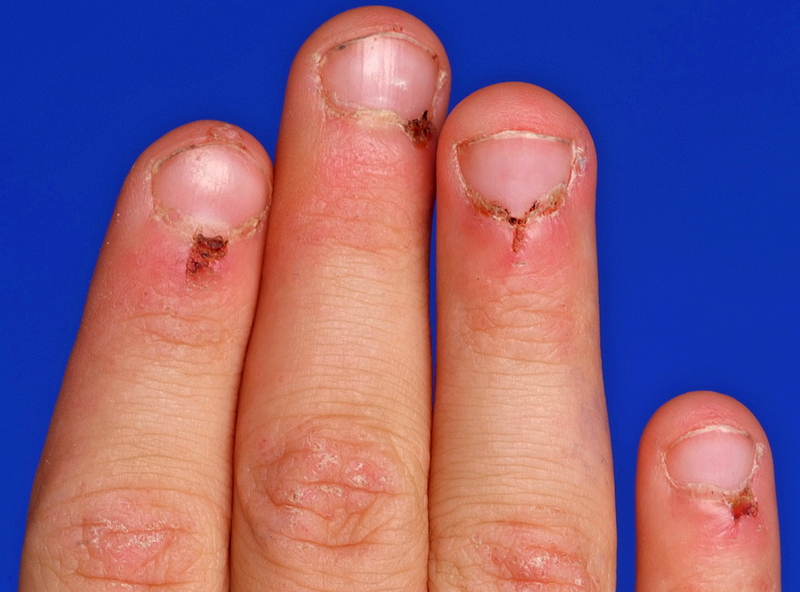 Nailfold capillary abnormalities in childhood rheumatic diseases. The nailfold capillary patterns of 84 patients with a variety of childhood rheumatic diseases and 34 normal control subjects were observed. Distinctive morphologic abnormalities with capillary dilation and dropout of surrounding structures were noted in two groups: patients with childhood dermatomyositis and with scleroderma (P less than 0.001). Among those with scleroderma, capillary abnormalities were found in all nine patients with systemic disease and in none of 10 patients with cutaneous disease only (Fisher’s exact P less than 0.001). Of 25 patients with dermatomyositis for whom muscle biopsies were available for analysis, abnormal nailfold capillary pattern was found with highest prevalence in patients with two or more specific vascular lesions noted on biopsy (Fisher’s exact P = 0.041). 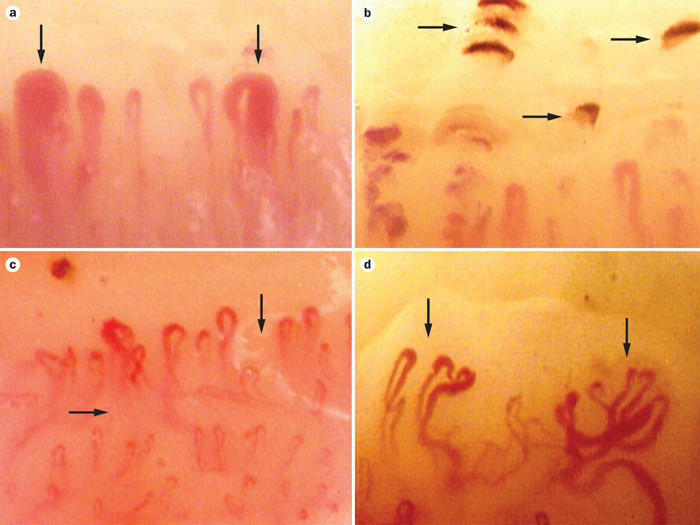 Nailfold capillary abnormalities are present in distinct populations of childhood rheumatic diseases, reflect the underlying vasculopathy of childhood dermatomyositis, and may be of diagnostic value in distinguishing localized from systemic scleroderma. Diabetes mellitus (DM) is associated with a state of chronic hyperglycemia with a highly increased risk of vascular complications. The current study aimed to investigate microcirculation abnormalities in patients with type 2 DM and those with pre-DM using nailfold videocapillaroscopy (NVC) and evaluate the possible correlation with microvascular complications. A total of 115 patients with type 2 DM, 41 patients with pre-DM, and 37 healthy subjects without diabetes were enrolled. All subjects underwent NVC to evaluate capillary density, length, morphology, distribution, presence of enlarged loops or hemorrhages, and blood flow. NVC score was used to quantitate the aforementioned characteristics. Patients with type 2 DM showed significantly increased alterations including reduced capillary length (29.6%), irregular distribution (35.7%), and abnormal morphology (59.1%), while the corresponding NVC scores were comparable to those of control subjects. In addition, subjects with pre-DM had a significantly higher NVC score and greater alterations in distribution (26.8%) and morphology (48.8%) than control subjects. NVC score was positively correlated with diabetic peripheral neuropathy (DPN) and the number of microvascular complications. NVC identified a high frequency of microcirculation abnormalities in subjects with pre-DM or type 2 DM compared to those in the control group. NVC score was also capable of detecting microvascular complications in patients with type 2 DM and was correlated with DPN and the number of microvascular complications. As population growth, aging, and the prevalence of obesity and inactivity have continued to increase rapidly, diabetes mellitus (DM) has become a major burden of adult public health. DM increases the risk of adult disability and premature death and creates a tremendous socioeconomic burden due to micro- and macrovascular complications. The long-term microvascular complications of diabetes include retinopathy, nephropathy, and neuropathy. Several risk factors, such as duration of diabetes and degree of glycemic control, are involved in the clinical course of micro- and macroangiopathy. Thus, clinicians should focus closely on vascular complications in patients with diabetes. Nailfold videocapillaroscopy (NVC) is a noninvasive diagnostic method that is used to evaluate the microcirculation and identify microvascular patterns in many rheumatic diseases, particularly systemic sclerosis and related disorders. 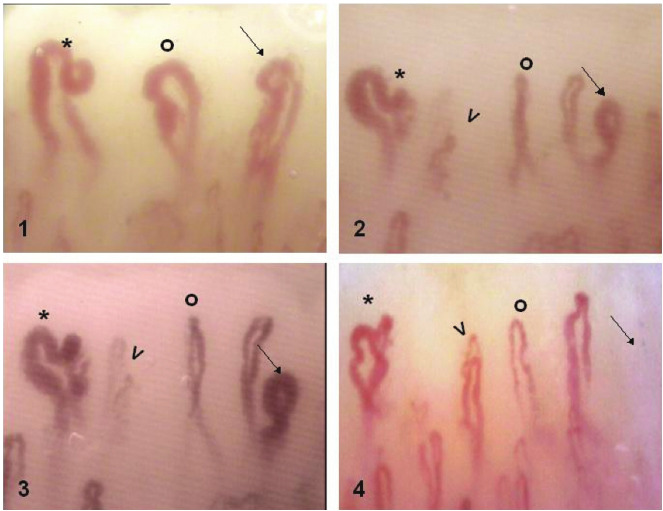 NVC is used to evaluate the morphology, distribution, density, and blood flow of nailfold dermal papillary capillaries. However, diabetic microangiopathy is a frequent and often early complication that mainly involves the retinal and renal microcirculations. Few previous studies demonstrated the presence of abnormalities in nailfold microcirculation and capillary morphology in patients with diabetes.However, NVC has been shown to qualitatively and quantitatively identify microcirculation abnormalities in diabetic patients, and changes detected using NVC showed a positive correlation with diabetic retinopathy. However, their microvascular characteristics and correlation with glycemic control and classical microvascular complications have not been systematically investigated. This study had 3 aims: 1st, to investigate the nailfold capillary abnormalities in patients with type 2 DM or pre-DM versus control subjects; 2nd, to compare the NVC characteristics in patients with type 2 DM according to disease duration and glycated hemoglobin (hemoglobin A1c [HbA1c]) level; and 3rd, to determine whether NVC score was correlated with diabetic microvascular complications. This was an observational cross-sectional and clinical pilot cohort study (protocol identification number NCT02564913. All candidates underwent a standardized interview process. The participants were introduced to the study purpose, procedures, potential risks, and benefits. Subsequently, they signed the informed consent form. The trial protocol was approved by the Institutional Review Board of Changhua Christian Hospital, Changhua, Taiwan (institutional review board reference number: 111106). The participants in this prospective cross-sectional study were recruited from January 2012 to December 2013 from the outpatient clinic of endocrinology and Chinese medicine at Changhua Christian Hospital, Changhua, Taiwan. Participants in the type 2 DM group were diagnosed with DM based on criteria recommended by the American Diabetes Association and required to have a fasting plasma glucose of ≥7 mmol/L or an HbA1c of ≥6.5%, as measured on 2 separate occasions. People with pre-DM have a fasting glucose level of 5.6 to 7 mmol/L (impaired fasting glucose) or a 2-hour plasma glucose level of 7.8 to 11.1 mmol/L after an oral glucose tolerance test (impaired glucose tolerance) on 2 separate occasions.Participants in the control group had a normal fasting glucose level (<5.6 mmol/L). Exclusion criteria were cancer, active liver disease, current pregnancy, active infection, and cerebrovascular disease. All participants underwent a medical history collection, clinical examination including measurement of blood pressure (mmHg) and body mass index (kg/m2); and routine biochemistry testing including HbA1c (%), fasting blood glucose (mmol/L), triglycerides (mmol/L), total cholesterol (mmol/L), high-density lipoprotein cholesterol (mmol/L), and low-density lipoprotein cholesterol (mmol/L).